Shanita Brackett is the Chief IT Portfolio Officer at the National Museum of African American History and Culture of the Smithsonian Institution. 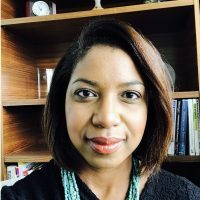 Shanita draws from over 15 years of experience across public and private sectors to lead the museum's portfolio management team. As a certified PMP and COTR, Shanita is responsible for budgeting, forecasting and determining technology needs to achieve the museum’s vision. Shanita also ensures that project managers and technical experts follow best practices to implement innovative toolsets. Unlike many of her peers in the public sector, Shanita has managed successful IT project management teams remotely for the last 6 years. Her vision is to encourage a customer-focused, IT portfolio management practice that thrives in today’s virtual environment. Shanita is a two-time alum of the University of Virginia, receiving her B.S. in Chemical Engineering and M.S. in Management of IT. She lives in Atlanta, GA with her daughter Kayla.